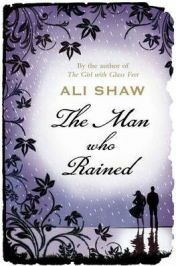 The Man Who Rained is a second novel by Ali Shaw, who previously had considerable success with The Girl with Glass Feet. Both novels are modern fables, telling a magical story with the aim of imparting some moral message about life. The Man Who Rained is, as its title suggests, about a man (Finn) who is weather personified. It works as a romantic fairy tale, but like many fairy tales has more serious intent. The central image of this book is lightening – in more than one place Shaw tells us that lightening does not just strike, it is a connection made in secret between the earth and the storm. Lightening is a metaphor for falling in love at first sight and in this book the weather is an extended metaphor for the turbulence and unpredictability which can lie within other people. We can attempt to control and subdue the weather or we can embrace it in all its unpredictability – in the former case will live quiet, regular, limited lives and in the latter we will experience unpredictable extremes. One of the messages of this fable if that we should do the latter if we want to really experience life. At the core of The Man Who Rained is Elsa, who runs away from her life and relationship in New York to find herself in the sinister neo-gothic Thunderstown, where the weather comes to life in the form of magical animals. Elsa has a history so far as weather is concerned – her father was a storm chaser who was ultimately killed by a tornado. In Thunderstown Elsa meets Finn, a mysterious recluse living in the mountains, who turns out to be a thunderstorm personified. Elsa falls in love with him but inevitably the path of true love does not run smooth. Meanwhile, Daniel Fossiter embodies many of the traditional values of Thunderstown, but is becoming increasingly disillusioned by his role as the culler of the magical animals which surround and occasionally invade the town. He is the only inhabitant of Thunderstown to know about Finn, and it is inevitable that the paths of Elsa, Finn and Daniel will collide with dramatic consequences for each of them. The Man Who Rained is generally well written, though for me the characters were not altogether convincing at times. The magical elements are carefully woven into the story and in no way jar or stand out. This is a romantic novel and I would imagine will appeal more to female readers than male – my comments should be interpreted in that context. Ali Shaw has written two novels with similar themes and approaches. There is no doubt that he is a talented author, but hopefully he will stretch himself further next time rather than staying within the confines of this genre. In the meantime, this is a book which I would strongly recommend to lovers of romantic fiction and fairy tales. It is easily digested and will provoke a little thought. No Comments on "The Man Who Rained"